Washington and Lee’s fledgling dance program and senior Zaq Lawal won major recognition last weekend during the American College Dance Concert at Virginia Commonwealth University, in Richmond. 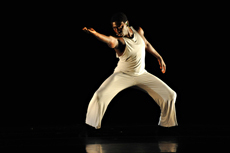 Zaq’s dance, “Metamorphosis,” was among a dozen outstanding works that a panel of judges chose from the 45 that were submitted by the 27 participating colleges and universities for performance at the closing gala. Zaq, an economics major, will be one of the first W&L students to graduate with a dance minor. He’s already signed on for a job with Heinz next year. According to Jenefer Davies, W&L assistant professor of dance and artistic director of the W&L Repertory Dance Company, Zaq was lauded for his performance and for “projecting and embodying his brilliant powerful movement” by three nationally recognized dance adjudicators — Denise Jefferson, a former Alvin Ailey dancer and director of The Ailey School; Janis Brenner, a Juilliard teacher and the leader of Janis Brenner & Dancers; and Susan Hadley, a professor of dance at Ohio State University and a former Mark Morris dancer. Davies also praised the support the program has received from Dean of the College Hank Dobin and her colleagues in the Theater Department.